Some time ago Ruth Young wrote a typically lucid and concise ‘Beginnings of the LBT’, which can be read at https://goo.gl/Bsb96P . A key date which Ruth identified in this history is ‘Incorporation’ which occurred in 2008 – and now we’ve made it to ripe old age of 20! 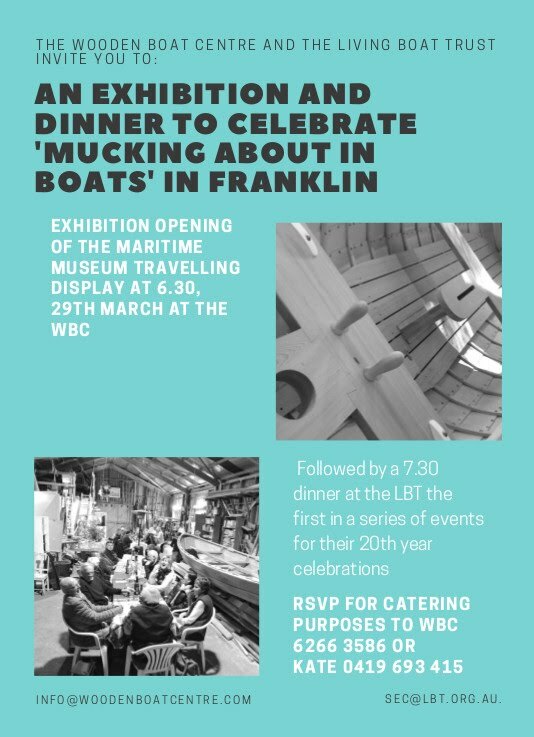 The first of what we hope are multiple celebrations to honor this momentous event will kick off on the evening of Thursday March 29th, and is being organised in conjunction with the Wooden Boat Centre. There will be an exhibition and some ceremonials at the Centre starting at 6.30pm, followed by a dinner at the 7.30pm at the LBT. See the flyer below for more details. RSVP for catering purposes to WBC 6266 3586 or Kate 0419 693 415. Cost is $15. This will also be an opportunity to honour Ruth and John Young without whom the establishment of our organisations almost certainly wouldn’t have come to pass.